Paris, L’Harmattan, 2014, 249 pp. This book is the result of research conducted by Jérôme Doyon for his Master’s thesis. The young scholar, currently pursuing his doctorate, carried out expert field work in early 2011 in Nanjing municipality. 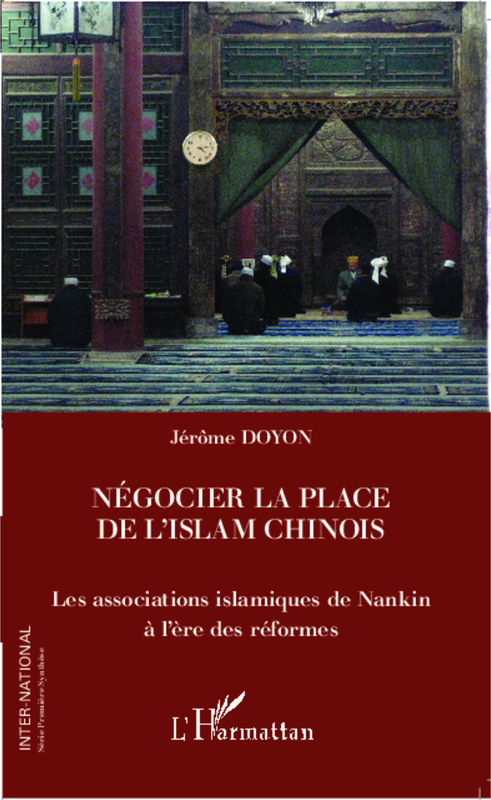 The author chose to focus on the role, functioning, and interactions of local branches of the Islamic Association of China (IAC) in Nanjing (IAN) and Jiangsu (IAJ). He starts off with the observation that the Chinese state’s control over its Muslim populations operates in the special contexts of each region and leads to diverse configurations. This original monograph adopts a “micro” analysis framework, making a break with the top-down approaches often pursued in the study of state control measures relating to religion. The information collected by the author helps reconstitute, based on recontextualised subjectivities, the ways of functioning of the IAC’s local branches and the challenges they face. It is rare to come across Western scholars’ work regarding the complex mechanisms of interactions among believers, different strata and compartments of the Chinese administration, and the IAC. This is a sensitive subject especially in areas with Muslim majorities in the northwest of China. The author opportunely explored a much less sensitive context in Nanjing by interviewing academics, clerics, the laity, IAC members, and officials. The book’s interest lies in taking the reader into the lives of the IAC’s branches in Jiangsu. Doyon sheds light on the motivations of their officials and interlocutors (the local and central administration, the Communist Party, local laity, and those from other provinces) and presents a broad picture of the constraints and resources they deal with. The finesse of his analysis lies as much in his reliance on solid knowledge of conceptual frameworks of social sciences as of works published in recent years on the oversight of religion in China. In the first chapter, Doyon notes the IAC’s role in the management of religious sites in Nanjing, evaluating to what extent it forms part of the continuities of associations that preceded it, as well as the extent to which it departs from them. He mentions the specificities of the local context: ethnic and sectarian homogeneity, the IAN’s financial resources, and absence of political conflict or financial disputes with the administration, etc. This context explains to a great extent the modes of control and financial management adopted by the IAN and IAJ. Given the meagre potential for financing of the small local Muslim community and of funding being linked to income from the IAN property and governmental connections, the IAN has acquired a major degree of control over the finances and activities of local religious sites. It is worth noting that the IAN and IAJ face less pressure from the state and enjoy greater elbow room given the relaxed local political context. In the second chapter, Doyon deals with the association’s internal functioning, the process for the selection of its officials, and the intermingling of personnel in the AIC’s different strata. He describes the relations with administrative organs deputed to control them and political entities able to provide a platform for their members. He notes the asymmetry in their relations with the state and raises the issue of their representative character. He describes the circles closely linked to the administration thanks to the process of selecting members, financial dependence, and due to systems of concerted action or decision-making with the Religious Affairs Bureaus and United Front Departments. This state of affairs is meant to instil an internalisation in the IAC of the politico-ideological line of the state and the Party. Moreover, this phenomenon explains the filtering out of believers’ “unrealistic” demands in the framework of the process of mediation or representation. The author describes this form of modus vivendi, which, while being asymmetrical, is compensated through a satisfactory “give-and-take” for all concerned. The interactions between the IAC’s local branches and the administration rest on sharing networks and exchanges of services. The presence of ethnic Hui academics, clerics, political, and administrative personnel in the IAC local branches gives birth to networks and competence pools helping push requests (authorisations and financing of new infrastructures or religious events). Thus, even if IAC local branches are seen by local populations or religious personnel as pro-governmental entities, they draw legitimacy from their ability to collect state funding or obtain authorisation for activities likely to be problematic in other Muslim regions. This covers activities in the “grey area,” meaning those on the margins of orthodoxy and legal framework as well as those taking place outside the mosques. In sum, Doyon depicts the associations as pressure groups, mediators, and the state’s intermediaries to reach the laity, all rolled into one. In the last two chapters he envisages, in light of the relationship with the Party-state again, the function of institutionalisation of communities and of definition/control of practices or identities within the Muslim community. He invokes also the role of the IAN and IAJ in the control of religious sites, the curbing of activism in the communities, education of religious personnel, and information of the administration. Citing concrete instances, he stresses the IAC’s socio-charitable as well as diplomatic role. The book contains a few anecdotal imprecisions that Islamologists can pick out (for example, the festival Kaizhaijie or Id al-Fitr is presented as occurring at the start rather than at the end of the month of Ramadan). Nevertheless, this insightful work containing rich information and analysis constitutes a necessary source for those interested in the functioning of the IAC’s local branches, the Chinese state’s religious policy, or Jiangsu’s Hui communities. Rémi Castets is an associate professor at Bordeaux Montaigne University (remi.castets@u-bordeaux-montaigne.fr).